Bob and John, a Grade 1 winner who ran in the 2006 Kentucky Derby and Belmont Stakes, was euthanized on Dec. 10 due to complications from laminitis, according to Korean Racing Authority records and Alastair Middleton of the KRA. The 15-year-old son of Seeking the Gold had resided at Isidore Farm in Korea since early 2016, previously standing at Saratoga Stud in New York and debuting at at Pin Oak Stud in Kentucky during the 2008 breeding season. Per Middleton, the Korean farm's owners first noticed soreness in the horse's front feet a few months ago and treated the laminitic conditions early, but they became progressively worse. Seeing there was no path to a comfortable recovery, the farm made the decision to euthanize the stallion to avoid unnecessary suffering. Bob and John's domestic runners were led by G2-placed stakes winner Brothersofthetime and G3-placed stakes winners Pain and Misery and Why Two. His first Korean-sired foals are yearlings of 2018, and he has one more crop set to arrive during the upcoming foaling season. Middleton said Bob and John bred about 20 mares in each of his first two seasons, which is an average number for a new sire standing privately in Korea. Isidore Farm also stands Ecton Park, a U.S. G1 winner who has become a cornerstone sire in Korea. 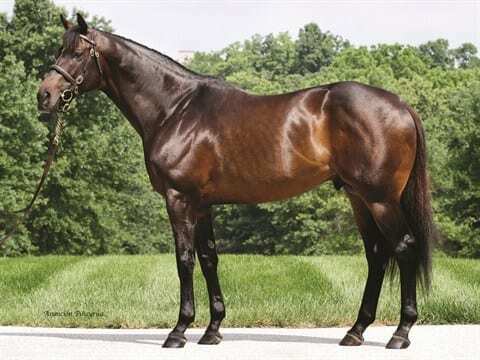 The horse raced as a homebred for Stonerside Stable – named for owner Bob McNair and Stonerside Farm manager John Adger – and he was trained by Bob Baffert. He finished in the money in the listed Real Quiet Stakes and G1 Hollywood Futurity as a juvenile, then came back in the spring of his 3-year-old season to win the G3 Sham Stakes, finish third in the G2 San Felipe Stakes, and win the G1 Wood Memorial. He finished 17th to Barbaro in the 2006 Kentucky Derby, then ran eighth behind Jazil in that year's Belmont Stakes. Bob and John returned to the races in the summer of his sophomore year to run second in the listed El Cajon Stakes at Del Mar. At four, the colt finished second in the G3 Texas Mile Stakes at Lone Star Park, then returned to the same track to win the G3 Lone Star Handicap in what would be his final start. Bob and John retired with five wins in 14 starts for earnings of $996,330. This entry was posted in Bloodstock, NL List and tagged 2006 Belmont Stakes, 2006 kentucky derby, Bob and John, bob mcnair, John Adger, Korea, Stallion Obituaries, Stonerside Stable, wood memorial by Joe Nevills. Bookmark the permalink.